The authorities of the two countries greet the event as a “new beginning” in their energy cooperation. 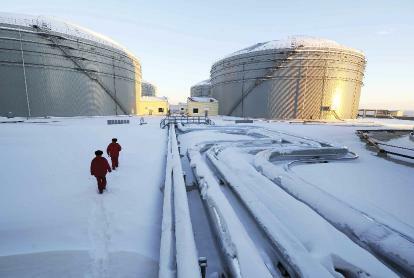 The pipeline is expected to send 300,000 barrels of Siberian crude to refineries in Daqing. Moscow now wants to boost its energy exports to the Orient. Moscow (AsiaNews/Agencies) – The first oil pipeline linking Siberian oil fields to refineries in the northeastern Chinese city of Daqing was inaugurated on 1 January. It is expected to carry 300,000 barrels a day over the next 20 years. Until last year, oil between the world's biggest oil producer, Russia, and the world's biggest consumer of energy, China, was transported by rail. The US$ 25bn project was partly financed by Chinese loans in exchange of 20 years of oil supplies. A second stage of construction on the pipeline is due to be finished by 2014. It will then span a distance of about 4,700 kilometres. “The operation of the China-Russia crude oil pipeline is the start of a new phase in China-Russia energy co-operation,” said Yao Wei, general manager of Pipeline Branch of Petro China (for more on the topic, see also “Siberian oil for China”, in AsiaNews, 27 October 2008; “Medvedev goes to Beijing on his first trip abroad,” in ibid., 23 May 2008; “Hu in Moscow to strengthen political and economic ties,” in ibid., 23 March 2007; and “Moscow-Beijing axis emerging around weapons and oil, keeping US out,” in ibid., 26 February 2007). Until now, its 50,000-kilometre oil pipeline network was concentrated in Western Siberia and runs towards Europe. In October 2009, Russian giant Gazprom and CNPC signed a framework agreement providing for deliveries of 70 billion cubic metres of Russian gas to China each year.